Taiji is a small town in Wakayama Prefecture, Japan, inconsequential except for its notoriety as the site of the regular and highly controversial slaughter of large numbers of dolphins. 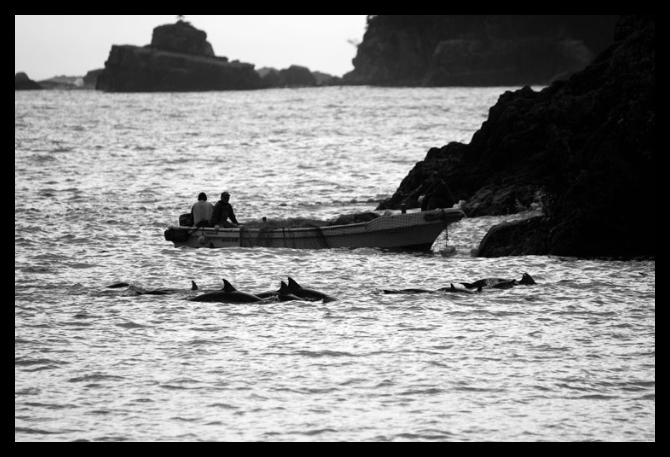 Endorsed by the Japanese government, details of the slaughter are systematically concealed by local authorities, so much so that the producers of 2009 documentary, The Cove, were forced to use guerrilla techniques to get cameras close to the slaughter site. Taiji continues to be the focus of international activist groups, Save Japan Dolphins and Sea Shepherd Conservation Society, who hope to end the slaughter as well as the international trade in aquarium dolphins that fuels it. 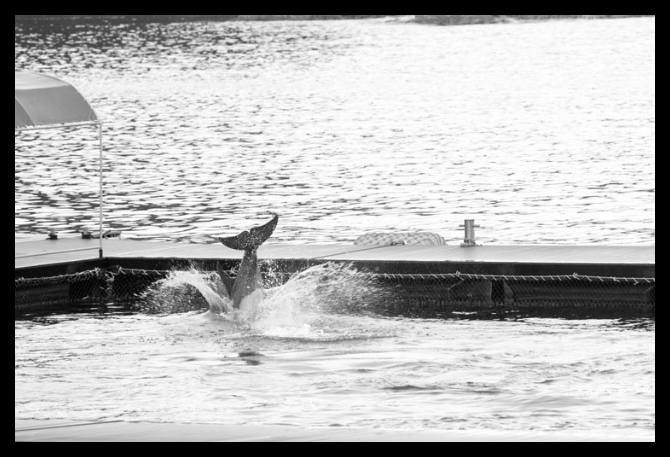 Taiji first came to our attention when we saw The Cove in the 2010 Milano Film Festival, so it was with surprise that we immediately recognised the infamous site as the subject of a recent exhibition at Obscura Gallery by Melbourne photographer, Georgia Laughton. We attended the exhibition opening as guests of Samantha Cuffe, a talented glass artist we have discussed previously here. We conducted the following interview with Georgia over recent weeks, gaining insight into her thoughts, experiences and ambitions for her work. Thanks for agreeing to the interview, Georgia. Can you start by explaining what lead you to becoming involved with documenting the dolphin slaughter in Taiji? Ever since I can remember I have been concerned about the state of the planet, and especially the state of the ocean. I became interested in animal rights when I was shown my first copy of a magazine by Animal Liberation at the age of 14, so the path that led me to be in Taiji is easy for me to track. I had been an on-shore volunteer with Sea Shepherd Conservation Society since 2008. At the time I went to Japan I was volunteering and working as the Melbourne volunteer coordinator, so was very aware of what was happening in Taiji (and many other parts of the world) every year. The decision to actually go over to Taiji was made very quickly one day in November 2010. I was reading the daily update over what was happening there, and a pod of pilot whales had been slaughtered that day. About 4 of them had been killed. That slaughter just got to me, and I decided I wanted to go over to document and photograph it myself in order to help spread awareness over the issue. Why did you select the photos included in the exhibition? What attracted you to document those in particular? The images were selected to form a collection which tells the story of both events which happen to the dolphins in Taiji – and which I saw – dolphins being captured for a life in captivity and dolphins being driven into the cove to be slaughtered. I wanted to document both captivity and slaughter, rather than just focus on one or the other, as both industries are linked. What about access? Some of the photos appear to have been shot under the cover of foliage. Were you able to take all the photos you wanted? 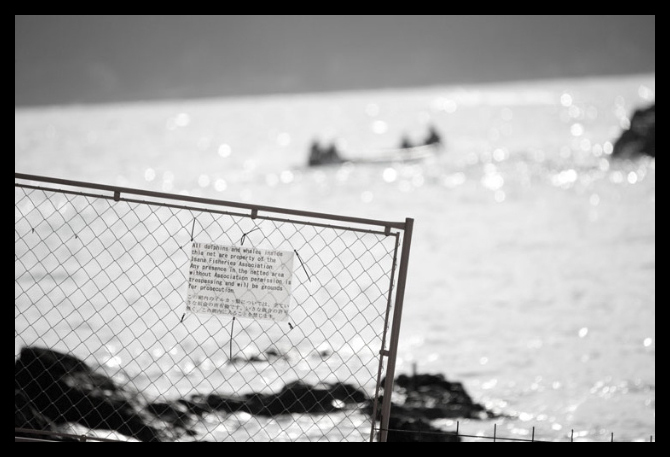 Access was difficult – obviously the fishermen wish to keep their actions hidden as much as possible, so they try to cover up all they can with tarps. This did make obtaining some of the images difficult – it was possible to shoot down into the Cove for some, however it was difficult to get past the foliage and to pass barriers. Areas are blocked off with Do Not Tresspass signs on the barriers (written in both English and Japanese). The one image of the dolphin being dragged in alive by its rostuem was taken when I was hiding on top of the cliff top – hiding from the fishermen who comb through the area to try and make sure clear images of their actions cannot be taken. A few minutes after that image was taken the police did come along and asked me to move – a request I happily obeyed. Were there others you wished you could have captured but couldn’t? There were images which I wanted to take which just weren’t possible. It was not possible to photograph the Fishery Union Building where they process the dolphin meat and where, each morning, the fishermen huddle around a fire and cook and eat dolphin. Due to the tarps, it was not possible to photograph the slaughter either. I could hear it happening, I could see the blood coming out in the water, however I could not see the actions. Do the gruesome images of the method of slaughter need to be photographed? Would it add to the series of the images? I don’t know. Part of me likes the fact I do not have the horrific images of extreme cruelty. I also had the conflict of photographing the Whale Museum, where many dolphins are kept in captivity. I did not wish for any of my money to go and support this business nor did I wish to add to their attendence numbers. This did mean I do not have any photographs of how the dolphins live their life in captivity, apart from when they are in their sea pens being trained. One particular image I do wish I had captured was the day prior to my departure from Taiji. It was the end of the slaughter season and the fishermen had been busy cleaning down the slaughterhouse and taking down all the tarps and nets. As the final boat of fishermen sailed past, they bowed to us – an image I will always kick myself for not having my camera out! We felt upon viewing the exhibition that it would have benefited from insight into the slaughter’s broader political / economic context. Have you considered juxtaposing your photos of Taiji against others of dolphin aquariums around the world, or even Japanese supermarkets that sell dolphin meat? Yes, I did think about showing images of the meat, and whilst I would love to have photographed the fishermen’s fire barrel over which they cook dolphin in the mornings, I made the decision not to include the images I had of the dolphin meat all packaged up into little bags for sale in the nearby towns. I wanted to focus on the events of the capture, the slaughter and how they actually happen. 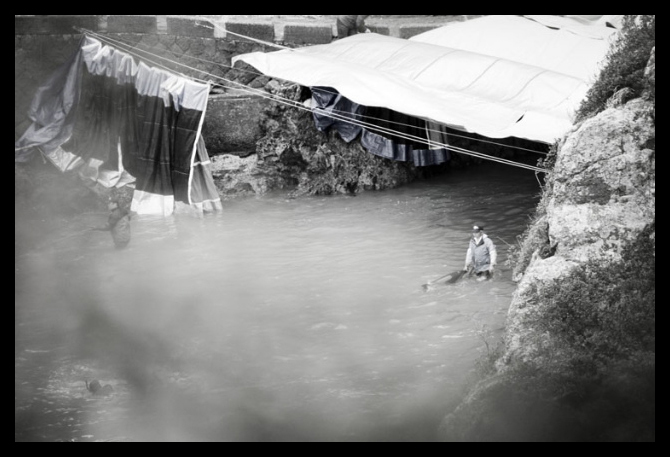 I wanted the viewer to be taken through the slaughter only up to the point the bodies are taken out of the Cove and covered up by tarps, with fishermen sitting upon them. 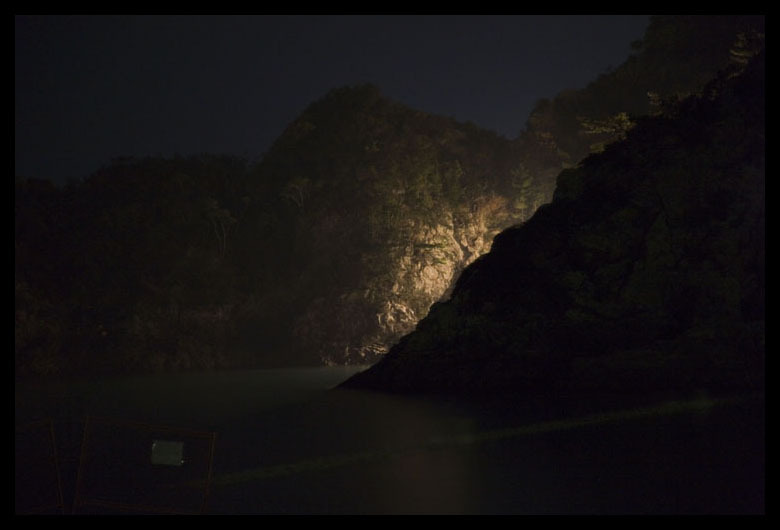 The only image I wanted after this is the final one, at night, where a light is kept on to illuminate the killing Cove while the rest of the area sits in darkness. What do you hope your exhibition will achieve? I am mainly hoping to raise awareness of the issue and hopefully spark some new thinking. There are so many issues of animal cruelty and others facing our oceans. It would be wonderful if a small seed has been planted into peoples’ minds which might make them look further into some of these issues and hopefully change their actions (a small change for the better is better than no change at all) and help support some of the many organisations which are working to fix some of these problems. I hope that if faced with the choice between going to a dolphinarium or not, that people who have seen the exhibition and remember the images will choose not to contribute any money towards maintaining the captivity industry. And what do you think it will take for Japan to cease harvesting dolphins? Sadly, in my opinion I think it will take a lot for Japan to stop harvesting dolphins. It has been proven that dolphin meat is highly toxic – to me the most basic of facts which should shut down the slaughter – yet the Japanese public is largely ignorant of the relevant health issues. The dolphin slaughter is hidden from them, yet in order for it to stop they need to get behind the urge for change. I think there also needs to be a world-wide ban on dolphins living in captivity. If no dolphins are being sold for captivity, where the bulk of income comes from, then the slaughter will also cease. Many organisations are working in various ways towards ending the slaughter and I would like to believe it will come to an end. The excuse of tradition is often used as a reason for it to continue, but if we look back in history, we see the end of many cruel traditions. It is simply not a tradition that makes sense in modern times. So what next? Do you have further plans to visit Taiji or other sites of animal cruelty around the world? I would like to venture back to Japan at some time in the future, however for now I wish to focus on animal cruelty which is happening here in Australia. Unfortunately there are many different areas of abuse of animals and the oceans happening here, from the unregulated kangaroo meat industry to the gas hub in the Kimberley. Thanks for the insight, Georgia, and all the best with future projects. Both the documentary, The Cove, and Laughton’s exhibition have left an impression on us. Understanding the context of the dolphin industry, and what happens in the hidden shadows to introduce dolphins into captivity, have forever poisoned dolphinariums for us. In captivity, dolphins are often kept in small, barren tanks. In the wild, dolphins will swim up to 100km in a day, the only place our children will ever see them.